Yesterday I woke up and as usual one of the first things I do upon awakening is check my phone and have a quick gaze over my Twitter feed. On this morning it was filled with photos of Cecil the lion and the publics outrage over him being hunted down by American Dentist Walter Palmer. The more I read the story and the facts behind it the more I became completely disheartened with the world that we live in. I found myself feeling total hatred towards this man who I know so little about and that actions like his have been aided by others to take place. I cannot even begin to comprehend how anyone would ever want to cause suffering, pain and ultimately death to a defenceless animal. It baffles me even more so that someone would actually consider it a sport and pay thousands of dollars to take part in it. $50,000 to be precise. Ok I am a Vegan so any animal rights story is going to hit home hard to me. It's something that I care passionately about and something that has completely changed my life for the better over the past two years. But what has been interesting is that it would seem that the general public and people in authoritative positions are in total agreement that this was a terrible and horrific event that should have never taken place. I haven't seen one comment that shows support towards Cecil's death. However, what I have seen is many people arguing that people are not entitled to an opinion on this news story if they happen to be a meat eater. Just as with the Yulin dog meat festival, which took place earlier this year, there has again been public outcry over animal rights and consequent conversations taking place on social media as to who is entitled to have an opinion on this. I was interested to read one of my favourite documentary makers Louis Theroux's comments on the death of Cecil yesterday and it's clear from reading his piece that even he is concerned about coming across as a meat eating hypocrite. I believe that many people are missing the point here and instead of judging other people we should be uniting as a collective to fight against barbarous acts like this and others taking place, regardless of lifestyle choices. Now please don't get me wrong, many of the tweets I have seen this week I happen to agree with. For me personally a huge part of my decision two years ago to become vegetarian was due to me feeling like an animal loving hypocrite. I was and still am a huge animal lover but it really did take me time to make that connection between pets, wild animals and animals who happen to be part of our food chain all in fact being one. They are all thinking, feeling, living, breathing and sentient beings, so why should for example my pet dog have any more superiority, right to live and be loved over than say a pig? It didn't make sense to me and I knew that it was time to cut meat out of my diet and eventually another year later I began to make the transition to become Vegan. And all for the animals. If any meat eater is showing compassion towards high profile animal rights news stories such as Cecil then I think this can only be a good thing. The more people behind this the better. I also believe that if a meat eater is an animal lover and feels emotions for animal cruelty then I have hope that one day they too will make the same connection I did two years ago. But in the meantime I'm not going to bash them for showing support, instead I will encourage and continue to demonstrate and positively promote a Vegan and cruelty free lifestyle that is easily accessible to all. We can't ever let there be another incident like Cecil's death and I think it's time that the world pushes together for trophy hunting of these incredible creatures to be made completely illegal. The first step you can take to helping towards this is by signing the Justice For Cecil petition which has already achieved nearly 700,000 signatures. I sincerely hope that we never see a story like this in the news again and despite how dismayed I have felt with the world, I am hopeful for changes in the future. Well said Sarah. I'm a new vegan but a long time animal lover and I think everyone who's disgusted by Cecil's death need to come together, whether they eat animal products or not. I *do* see a lot of vegans who say meat eaters have no right to say anything about Cecil as they're as bad, but I don't agree. I think getting meat-eating animal lovers 'on side' as it were by not being judgemental and shouty is one step closer to them changing their habits. "As you know, I've been a vegan for 10 years, a passionate animal advocate and activist for at least 10 years and I believe every animal is worth fighting for. I totally understand and agree with the fact that you can't say you love animals and eat them. However, I believe that public awareness plays a HUGE factor in making progress in animal cruelty prevention and advocacy. 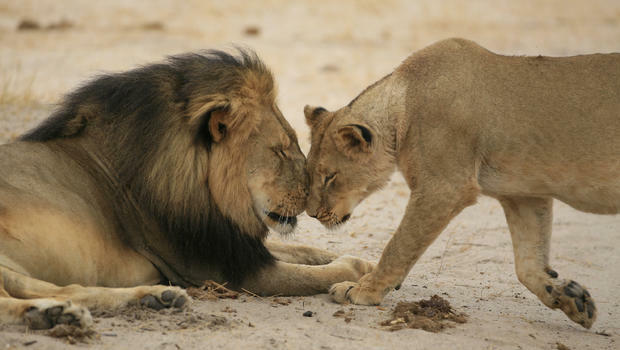 The overwhelming number of people, both vegan and non-vegan, that have expressed outrage over Cecil's murder should be viewed as something positive and not negatively because the more people that fight for animal rights, the better chance we have at seeing a much needed change. Animal advocacy is and always has been something of a delicate nature and I always try to think about the impact my actions will have on the lives and welfare of animals, and in this particular case, are we doing more harm than good by negating the voices of non-vegans that are mortified and outraged by this just as we vegans are? "